Lots else happened Wednesday other than the return of Earl Thomas. Here are the highlights. The big news Wednesday at the VMAC was that hold out free safety Earl Thomas returned to practice and could play Sunday at Denver. But that wasn’t all that happened. Here are six other things to know from what coach Pete Carroll and others had to say. This was no surprise as it became apparent a week ago Monday when K.J. Wright had arthroscopic knee surgery and was likely to miss the opener that Griffin would likely get the start in what will be his first NFL game, continuing to add one more amazing chapter onto another of his inspirational tale of perseverance (let alone playing alongside twin brother Shaquill). But Carroll ended any suspense when he announced during his weekly press conference that Wright is out for this week and that Griffin will start. That doesn’t mean Griffin doesn’t have a lot of room to grow. The Seahawks have talked this week of needing to understand they can’t expect Griffin to be at the same level as Wright — who has been in the league since 2011 — in terms of understanding the defense. In essence, simplifying things a little bit. But the hope and pan is that with maybe a little less on his plate but getting a little more experience each day he can be where they need him to be Sunday against Denver. Carroll said Wright could return next week but that they’ll need to wait until Wednesday or Thursday of next week to know. Seattle could get some help there in that its next game after the contest at Denver is on a Monday night at Chicago. The veteran receiver has yet to step foot on the field this season, held out of the preseason to get his knee in regular season shape. Baldwin playfully waved away questions about his health saying he had gotten some flack for saying last week he was at “80-85 percent.’’ The message is that Baldwin’s 100 percent now may be different than it was in years past but will have to be good enough. Coach Pete Carroll said he expects Baldwin to be the same as ever when he steps foot on the field Sunday at Denver. The Broncos have one of the pass rushers in the game in outside linebacker Von Miller, who is flanked by first-round pick Bradley Chubb – the number five overall selection — to form a duo that will challenge the Seahawks right out of the gate. 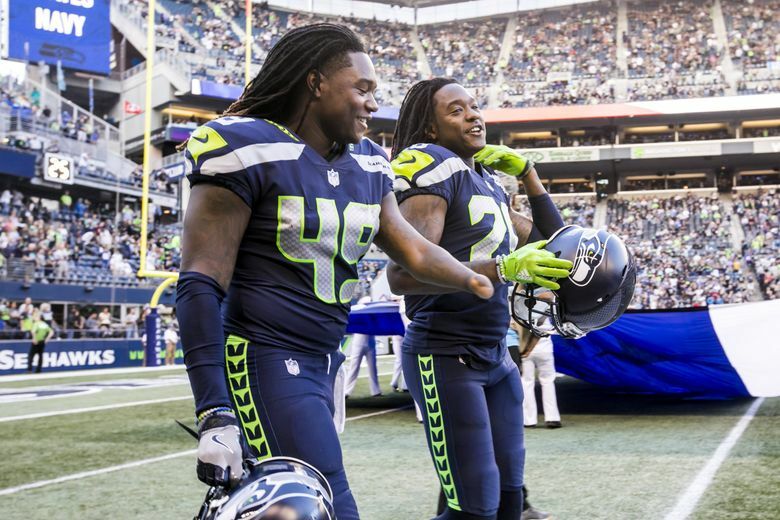 But Carroll says he thinks Seattle’s tackle duo of Duane Brown on the left and Germain Ifedi on the right is ready (Ifedi was listed as limited in practice Wednesday with an ankle sprain but is expected to play). Carroll later specifically cited Ifedi’s progress in the preseason. He was benched twice early in the preseason — once in a practice and another in the mock game — for penalties. And later, the Seahawks moved George Fant to the right side to give Ifedi some competition. But a strong performance in the third preseason game against the Vikings allowed Ifedi to hold on to the starting job — and rather emphatically, in Carroll’s view. The game will be the first for first-round pick Rashaad Penny, who was a full participant in practice Wednesday after having missed the last three preseason games with a broken finger suffered in practice. But for now, Penny remains behind Chris Carson, who believe it or not will be playing just his fifth NFL game on Sunday. The two will lead a running back corps the Seahawks hope will lead to a revived running game this season. Jordan, who was removed from the PUP (Physically Unable to Perform) list over the weekend was a limited participant in practice on Wednesday and it remains unclear if or how much he will be available against the Broncos. The best bet is that he’ll be active but could be limited. But assuming Jordan is at least limited, the Seahawks could be counting greatly on third-year vet Quinton Jefferson, who is listed as the starter at left defensive end on the depth chart this week. The Seahawks didn’t have much of an injury report Wednesday with just two players sitting out — Wright and right guard D.J. Fluker. As noted above, Wright has already been declared. The status is less clear for Fluker, who is dealing with a hamstring injury suffered in the third preseason game at Minnesota. But the fact that Fluker remains out 12 days after that game was played certainly indicates he may not be ready for the Denver game. The good news for Seattle is that they have a veteran ready to step in there — J.R. Sweezy. Sweezy is ready after not playing in the preseason, listed as a full participant Wednesday. Asked about Fluker Wednesday, Carroll said only “we’ll see’’ if he can play against Denver. Ifedi and Jordan — as discussed above – were each listed as limited. Everybody else was listed as a full participant including Baldwin and safety Tedric Thompson and cornerback Neiko Thorpe. Thorpe did not play in the preseason with a wrist injury but appears ready to return. Thompson suffered rib injuries and a stinger against the Vikings. He is listed as only dealing with ribs now. Seahawks middle linebacker Bobby Wagner talks about the return of Earl Thomas Wednesday.